Still dealing with this POS. There has to be a very special group of German engineers who gather at least annually to laugh at those they left behind to deal with their incredibly bs style of so called engineering. ALL injector boots replaced. ALL needed it. Been all over the drivers side of the motor with a spray looking for any other vacuum leaks which many of the injector boots had. No additional leaks found anywhere. Additionally, the OVP relay replaced with a 2 fuse version as was the one I pulled. NO CHANGE. Distributor cap and rotor were also replaced. Both were needed. From another site one suggestion I just got thru trying was to replace the AIR FLOW POTENTIOMETER which did not solve the issue. Spec is supposed to be 0.7mvdc +- 0.1mvdc. At operating temp, voltage ranges from 0.3 to 1.8mvdc. Rpm's range from ~500 to 1100rpm. Is there anyone here that has solved this issue ? By solve I mean had a M103 with a surging idle that something was done that actually left the M103 with a stable idle. I have to express that I am not looking for guesses...just resolution. I did see a video on youtube on this fault .Thinking he changed the fuel relay Is this in a 260e? or 300e ? You wll find it at the rear of battery ,pull away the plastic membrain ,you will see another black box close to the ovp relay.It will be hard to remove as it as lugs on the side of the base that pop in to slots on the holder thats in there.This is if it like my 260e .Just another thing that can make these symptoms, look down on to the engine from the top with air box removed.Loook for this T shaped item with two hoses going to it and electrical connection on the rear. This regulates the air in to engine if its gummed up it will give fluctuation of engine speed.It is held in there with a plastic sadle just 2 bolts to remove it .Get it out and spray inside with carb cleaner ,shake it a little then tip it out. Do this few times.Refit , check for damage on the 2 hoses as you put them back on. Do let us know how it works out for you please..
TnBob this is what your looking for . optimusprime, the fuel pump relay is one of the few things I havent changed, yet. Ive not only pulled and cleaned the IAV, but replaced it even after it checked good statically and on the car. Both the large vacuum lines including that absolute POS son of a bitxx one that goes to the block were changed. The one to the block was rock hard with the other one not far behind. Last edited by TnBob; 11-05-2015 at 11:19 AM. TnBOB do let us know how you get on please. I got so sick and tired of trying to get a decent, consistent idle, I removed the IAC valve and replaced it with a plumbing gate valve from home depot, I think it was 3/4" but I cant remember. It fit perfectly inside the hoses and secured with hose clamps. Air cleaner hides it. Set it and forget it. Low tech but works great. Bob - when do you get the surging? Does it happen immediately from cold? OR does it happen after you've been driving? But you did adjust it at operating temp didn't you? 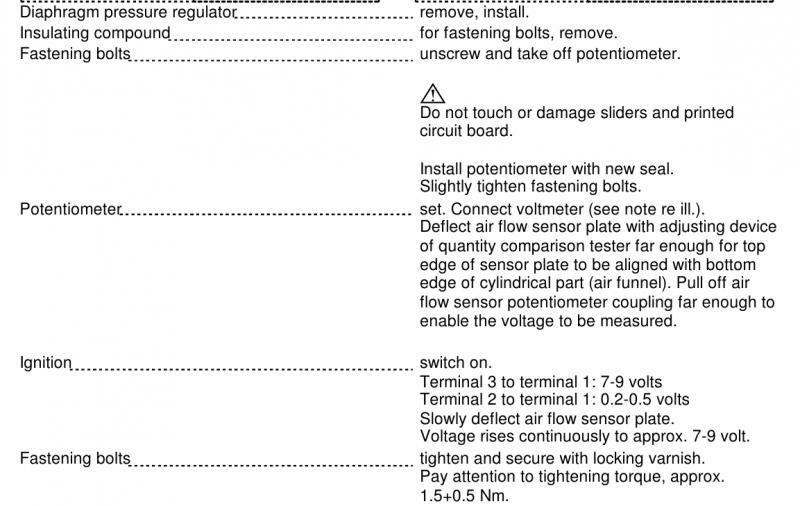 I have alternative instructions for the fitting of this potentiometer that do not include the "live" with engine running method. I'll dig 'em out and post them in a bit. For me, one of the few times it makes sense to send my cars to a pro and pay for one hour of their time, $120, is when I think it's going to cost me 2-3X as much time to figure it out. send it to a pro and have him tell you what's wrong once and for all? tilac, IAC powered or not seems to make no difference. How bout necking down to 1/'4'' ?? Vacuum problem my be . I hate to suggest it but perhaps you need to reconsider the water sensor and the resistor you installed? I've got a list of the output values as they should be if you're interested. My experience has shown that idle (before moving / driving the car) can be nice and smooth by making sure air idle control valve is working (so disconnect plug - idle goes up to about 1200 to 1500 rpm), making sure the air flow sensor is new without worn tracks, and replacing O2 sensor. I get the impression that the pressure difference in the upper and lower chambers in the fuel distributor also need to be checked but so far I haven't found the correct adapters to allow me to check this measurement and adjust the hydro-electric actuator (back of fuel distributor). Are there any fault codes?